Alright, let’s get back to the PRS data. 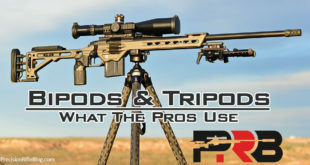 This post reviews the rifles suppressors and muzzle brakes the best precision rifle shooters were using in 2014. 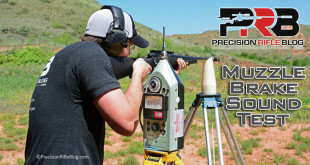 The data is based on a survey of the top 50 shooters in the Precision Rifle Series (PRS). The PRS tracks how top competitors place in major rifle matches across the country. These are the major leagues of sniper-style competitions, with targets typically in the 300-1000 yard range. This is the 3rd year we’ve collected this data. For more info on the Precision Rifle Series and who these guys are scroll to the bottom of this article. First, I asked the competitors if they ran suppressed or with a muzzle brake more often … or neither. If you remember, there were 5 shooters last year running neither, but this year there wasn’t a single shooter within the top 50 running a bare barrel. 69% of competitors typically ran a muzzle brake during a match, and 31% said it’s more common for them to run a suppressor in competitions. If you only look at what the top 20 shooters were using, it was a little more even, with 11 running muzzle brakes and 8 running suppressors. But among the top 10 it closely matched the split among the entire top 50, with 7 running muzzle brakes and 2 running suppressors. The math students in the house may notice that 7 + 2 isn’t 10. The shooter who finished 10th overall was the one competitor who didn’t complete the survey. Some competitors may decide to run one or the other, depending on the specifics of the match. Both muzzle brakes and suppressors reduce recoil, which can help you spot your shots, even at close distances. Muzzle brakes are more maneuverable, because they’re about a pound lighter and are shorter. Over 50% of the shooters were running 26” barrels, so adding several inches of suppressor to the end of that can make it feel like you’re trying to carry around a flagpole. But if you’re laying prone most of the day, then a suppressor can be preferable … especially if you’re firing near other competitors. You at least hope the guy next to you isn’t running a brake! 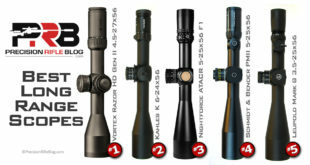 And here is the list of the most popular precision rifle suppressors among the top 50 shooters. In 2014, 26 shooters out of the top 50 said they use a suppressor regularly. 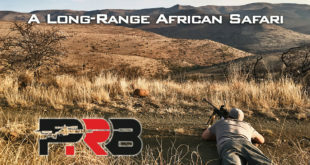 On top again this year, Thunder Beast Arms Corp. (TBAC) suppressors were the most popular choice among the top shooters in the country. Of the top 50 shooters running suppressed, 1 in 3 chose a Thunder Beast suppressor. That is quite a statement. 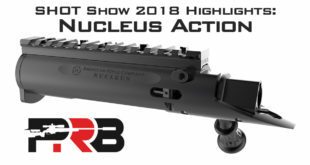 The TBAC 30P-1 is their flagship product for precision rifles, and can be spotted at most precision rifle competitions. I explained a few of the advantages of Thunder Beast suppressors in a recent post on my Custom 6XC Precision Rifle Build. The next most popular brand was Silencer Tech, with 28% of the suppressed shooters running one of their cans. Silencer Tech said the one most of these guys were running was their 6 inch direct-thread suppressor, which weighs just 14 ounces. That is the model that is pictured below. Right on their heels is SilencerCo, with 24% of shooters using one of their suppressors. SilencerCo has experienced incredible growth since their start in 2008. The SAKER 762 represents their premiere model for precision rifles. There were also a couple shooters using Jet Suppressors, and a couple using Surefire Suppressors. 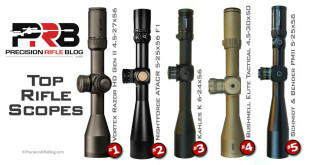 Here are the most popular muzzle brakes among the top precision riflemen in the country. 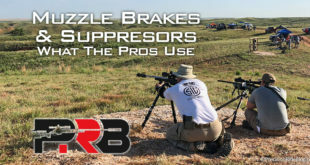 40 of the riflemen who finished in the top 50 said they regularly use a muzzle brake, and this data reflects what brake those 40 shooters said they used. It also shows how popular each brand was in the previous two seasons of the Precision Rifle Series. 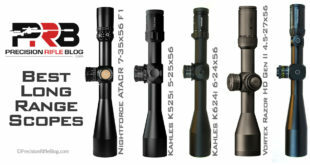 The 2nd most popular muzzle brake brand was Badger Ordnance, with 7 shooters represented among the top 50. If you narrow it to just the top 20 shooters, there were 2 using a Badger muzzle brake, and those two actually finished #2 and #4. 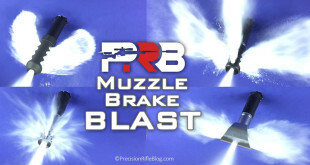 Badger has two styles of muzzle brakes that have been popular for a number of years: the FTE and the Thruster. There were 6 shooters using Center Shot Rifles (CSR) muzzle brakes, which landed it in #3. 4 of those shooters placed in the top 20, which makes CSR the most popular choice among competitors who finished in the top 20. CSR’s current model is the Blast Tamer, which comes in a few different models (round, slabbed, 3 port, 4 port, different thread patterns, clamp on versions, etc). A perennial favorite, JEC Customs, landed at #4 among the top 50 shooters in 2014, with 4 shooters using a JEC. 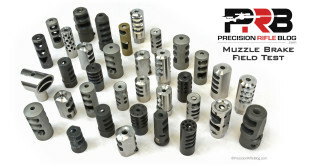 In 2012 and 2013, JEC muzzle brakes were clearly the most popular brake among the top precision shooters. Just last year, 43% of the shooters running this brake, which was almost double the next competitor. While it didn’t have the same commanding lead as it did in the past, this was still one of the most popular muzzle brakes among these top tier riflemen. Rounding out the top 5, was Impact Precision with 4 shooters using their brakes as well. 3 of those shooters were in the top 20, which makes Impact Precision the 2nd most popular brake among the top 20 shooters. 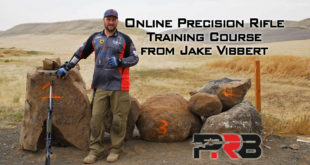 Impact Precision is a new company, but the owners include familiar names like Wade Stuteville (winner of the 2012 Precision Rifle Series, 20th overall in 2014) and Tate Streater (finished 15th overall in the 2014 Precision Rifle Series). So these brakes are obviously designed for precision rifles with these styles of competitions in mind. They offer the brake in a few sizes: 6mm, 6.5mm, 30 caliber, and 338 caliber. They don’t have a website yet, but you can get more info or place an order by calling (580)371-2510 or by emailing tstreater@tapematics.com. They should have a website up by the end of January, and I’ll post a link when I hear about it. 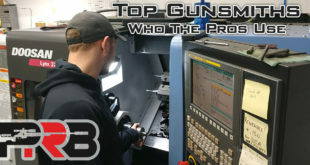 Behind those top 5 brands, there were a lot of other muzzle brakes represented by either 1 or 2 of the shooters in the top 50. Thank you for writing this series of articles. 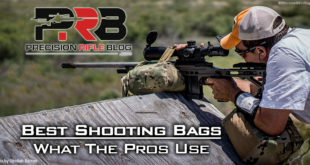 I am not a competitive long range shooter but I like to be informed of equipment that actually works rather than trying to sort through advertising hype. Please consider an article on triggers following the same format as your other reports, ie brands, weight, style etc. I shoot a Rem 700 and the trigger is often the first customization many make to their rifles. Hey, Kelly. Glad you’ve found this helpful. Sometimes looking at what the guys “in the know” are using is a good way to filter down the list of products. I recently replaced my HVAC system in my house (air handler, AC/heater, compressor, fresh air intake, etc). Man, that stuff has gotten complicated over the past 10 years! Even as an engineer who understands the basic principles, it can be quickly overwhelming. I ended up asking a few HVAC guys I know what they’d do if it was their home … and I just did what they recommended. I figured they understood all the little trade-offs of each setup and model, and if I just trusted what they would do, there would be little risk that I’d be way off the ideal solution. I could have tried to learn it all for myself, but just looking at what the experts are doing is a good shortcut, or at least a way to pair down the possible options to something more manageable. I’ve made a note to ask about triggers next year. You weren’t the first guy to suggest that, so it is worthy of asking. My guess is most of the guys were using the very popular Jewell Hunter Varmint Rifle (HVR) model trigger, or the Timney #510. But, I could be wrong … I’d prefer to have hard data on it, so maybe we will next year. But this might get you started in the right direction. I have to ask, how did you get a 69/31 split with just 50 shooters? if 15 contestants are using a suppressor, its 30%, and if 16 are running one its 32%. Even with rounding there is no way to get 31% unless you had half people running suppressors. But among the top 10 it closely matched the split among the entire top 50, with 7 running muzzle brakes and 2 running suppressors. The math students in the house may notice that 7 + 2 isn’t 10. The shooter who finished 10th overall was the one competitor who didn’t complete the survey. So the actual numbers were 34 shooters who said they most often run a muzzle brake, and 15 said they typically run a suppressor. 34 of 49 is 69.4%, and 15 of 49 is 30.6%. I obviously rounded to the nearest whole number. Hey Guys what about scope levels? What do the pros use there? Great question! When I saw this, I went back to a ton of pictures I took at the PRS Championship Match several weeks ago. I took around 200 photos as everyone was sighting in, so I zoomed into all the photos to see what the guys were using. The most popular level seemed to be the one integrated into a Spuhr scope mount. As I mentioned in the Scope Mount post, Spuhr was the most popular type of scope mount with 13 shooters using them. Here is a photo of the integrated scope level in the rear of the mount. That is actually my personal rifle. I’ve been using Spuhr mounts for 3+ years, and think they’re completely ideal. I also saw a lot of Vortex bubble levels in the photos. That might have been the 2nd most popular brand, judging by the photos. Some scope level manufacturers use plastic housings, air bubbles and subpar glass in their vials. Accuracy 1st utilizes a custom bent, in lieu of a straight vial, designed using medical grade glass with a ceramic ball. The use of the ceramic ball eliminates the inherent flaws associated with air bubble levels, which at higher temperatures and pressure will compromise the bubble size causing level inaccuracies. Typically air bubble levels require 3° to 5° to even register movement; however, the Accuracy 1st custom level will read movement at a minimum of 1° and will extend measurements out to +/- 10°. Here’s a look at some of these other popular models. There may be a couple others used, but those are the ones that were clearly popular among this crowd. I’ve personally owned and used every one of these that were mentioned. I like to tinker! I’d recommend the Spuhr mount or the Accuracy 1st curved level. I am not able to find anything on Impact Precision & there is no picture of their product either? Hey, Derrel. The company Impact Precision was just formed a couple months ago, so they’re still working on getting product info out. I personally talked to Wade Stuteville (one of the owners) just two days ago, and he’s going to get me a pic of the muzzle brake. I’ll post it here when I get it, and I bet that’s this week. If you want more info, you can call that number I listed in the post. That’s the only option at this point, but stay tuned for more info. They have a couple products in the works, and I bet they’ll be a household name within a year or two (at least among precision shooters). 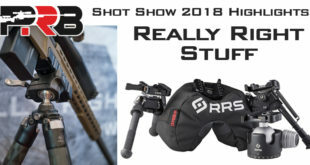 They may be planning to release more info around SHOT Show, which is just a few weeks away. And just to be clear, the partnership is new … but these guys have a ton of experience. Wade was GM of Surgeon Rifles for several years, and involved in their product development and other aspects of the company. And the way I understand it, the other partners are very experienced, professional machinists. They’re all expert riflemen. When you combine all those factors … You get something pretty unique. I’m anxious to see what they turn out over the next year. I try to gather all the info I can find for posts like this, and I realize your frustration with the lack of details. I’m trying to gather what I can, so please be patient. I’ll pass on whatever I can. Your articles have pulled back the curtain on all the equipment the “pros” use. They are pro shooters for a reason, and I for one have enjoyed reading these well written articles. Thanks, Chris. The encouragement goes a long ways! I put more time into this than you might think (and make almost nothing), so it’s good to know its beneficial. That’s my goal, and knowing its helping fellow shooters enough payment for me in itself. Chris, as like you, I am an engineer and avid researcher to any new activity I take on. Your recent updates to the series confirmed my choice in next-to-buy scope as the Vortex Gen II was great to see. I can also tell you that this year’s data has made me rethink my next barrel choice in manufacturer as well as caliber as I was thinking along the lines of the 260AI but am now seriously considering the 6mm’s given the drop charts you showed. It also surprised me that the powder I chose for my son’s High Power competition (8208XBR) was not anywhere on the listing as I thought I had adequately researched before I chose that one for multicaliber use. I guess I will be getting some H4350 soon. I really wanted to thank you as so many others have as this is exactly the type of information and format I would have wished for if I could have my wishes granted. You have done exceedingly well in both cases. Lastly, I wanted to direct your attention to a little known muzzle break manufacturer who I recommend you and your blog followers take a look at due to his putting out an empirical style of comparisons between differing types off muzzle devices. I would love to see one of his designs modified to accept something along the lines of the ThunderBeast 30P-1 can so as to have the best of both worlds. You can see his test-rig set-up at the link below. He is out of New Zealand and his USA distributor is located ata shoot-long.com and I am in no way affiliated with either but just so happy to see a test rig like he developed being shown on YT. That’s very cool. I’ve thought about doing a very similar test. There are a ton of muzzle brake designs, and I know some must be more effective than others. I hope to do a field test on them at some point, so I really appreciate you sharing this. Terrific stuff. When will we see the under $1500.00 scopes? Still no plans to do it anytime soon. Do you recall if the SilencerCo cans were all the Saker mentioned or if you saw any Specwars in the mix? Thanks for this great addition; I’m really glad to see suppressors are empirically proving that they don’t negatively effect accuracy. Hey, Martin. Unfortunately, I’m not certain exactly what models every shooter was using. The guys at SilencerCo might be able to tell you. I believe they’re pretty involved in competitions, so they may know the individual shooters and what specific models they’re using. And, I’m with you. There is lots of misinformation out there. I’ve even heard a couple guys claim a suppressor made their rifle more accurate. That seems unlikely. I think there are a few of the top brands that don’t negatively impact accuracy. I can personally vouch for the ThunderBeast 30P-1, because I’ve been running one for about a year. It’s impeccable. Good luck! Sorry I couldn’t be more help. Excellent well crafted study. Thanks. I could not find the JEC muzzle break in the Sound Test part of your study. Can you advise? The JEC was apparently not tested in the .308 Recoil Reduction section and does not appear in the Recoil Reduction Summary for .308 ? Does the JEC compare to the other caliber tested in the Recoil Reduction section? Is the JEC suitable for .308? I am about to buy the JEC for my .308. Can you advise a guess on the loudness rating and whether the 15d angles are a safety concern at the range. Hey, Andy. First, let me catch up the other people reading these comments. Andy is referencing my muzzle brake field test. You posted the comment on a related post, but not on related to the field test. I’ll do my best to answer your questions. JEC Customs Recoil Reduction Muzzle Brake – This has been a perennial favorite among PRS shooters, and is a very streamlined, elegant design. I used this brake last year on my quest to build the ultimate precision rifle. With “Recoil Reduction” in the name, I had to include it. 😉 I owned a 6mm version of this muzzle brake. I tried to contact JEC for 6.5mm and 30 caliber brakes for these tests, but wasn’t ever able to get in touch with them. Honestly, I had a case-head separation in my 6XC that knocked it out of commissioned for the rest of the day. So unfortunately, since I only had access to the sound meter that one day, I wasn’t able to meter the JEC Customs Recoil Reduction Muzzle Brake. I also wasn’t able to meter the Tubb Precision Muzzle Brake from behind the rifle. Sorry, guys! The JEC is certainly suitable for the 308, and a great choice for it. Anything from 22 caliber through 30 caliber would be ideal for that brake. Sorry for the confusion. As you can see in the summary of the test results, the JEC finished #2 overall. It is provides exceptional performance. Thanks for recap. Clears up my questions. I can’t get in touch with JEC either. I look forward to more of your very valuable work. The best article I’ve read on brakes. It’s a tough subject and up for more debate than whether to use .45 or 9mm! It isn’t as hot a spot because people who use them don’t really have all the testing down and aren’t comfortable stacking their reputation on one. The reality is the effectiveness of brakes can’t be denied and the results above clearly show that. It is by no means an inclusive list, but when you’re ready to put your name on a product you can’t go wrong with proven results and these results show it. Thanks, Allen. Glad you found this helpful. You might also be interested in the muzzle brake field test results I published a few months ago. I made actual measurements of recoil reduction, noise level, and a bunch of other metrics for the most popular brakes.